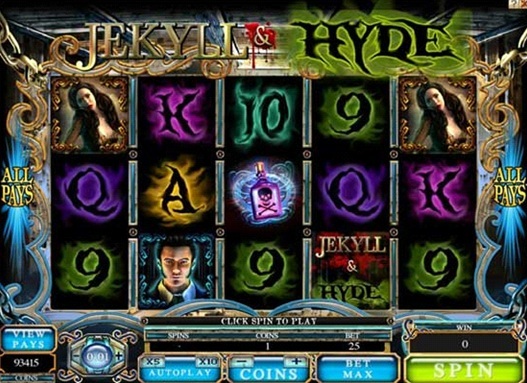 Jekyll and Hyde is a slot machine themed around the famous novel written by Robert Louis Stevenson, which was called “Strange Case of Dr Jekyll and Mr Hyde”. The two that are mentioned in the title are the main characters of the novel, where the action revolves around a lawyer from London that’s investigating events that have transpired between his friend, called Dr. Jekyll, and the evil Mr. Hyde. Ultimately, he finds out that both of them are sides of the same coin, as the doctor had a split personality, one evil, the other good. Microgaming has created a slot machine based on these two characters, and you can find out more about what it has to offer below. A total of 1024 ways to win are available in the game, with 5 reels being enough to host them all. 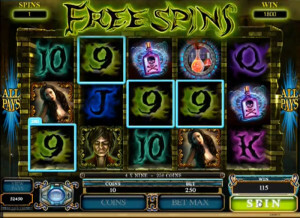 Some very special free spins are offered, and they are the ones that can give you the best payouts, of $7,000, while the base game gives you $1,500. 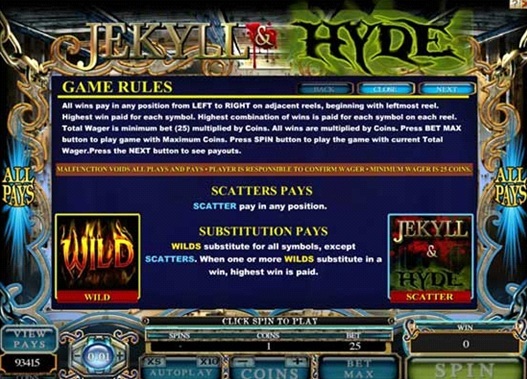 The features are all common, including a wild, a scatter and free spins. 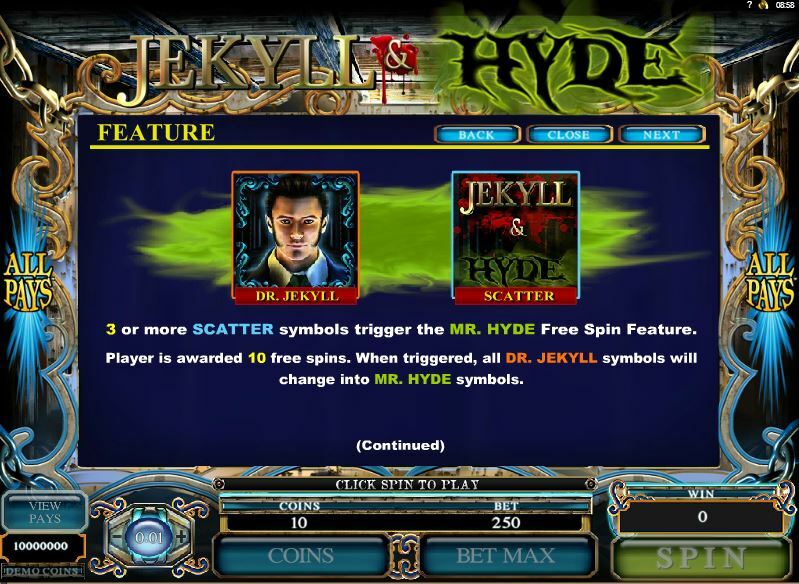 There is nothing truly special here, but I did enjoy the use of Mr. Hyde characters, instead of Dr. Jekyll symbols, when the free spins are active. The Wild Logo is just that, the wild feature. It is going to be the symbol that you rely on to get more combinations formed, and more prizes awarded to you. You’re not getting any additional roles from this wild, with no multipliers to apply or prizes to give away directly. The scatters are the only ones that the Wild can’t substitute for. 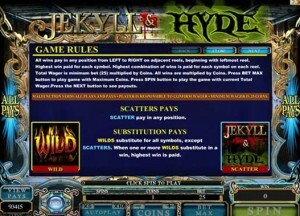 The scatter has the Game Logo on it, and it’s a symbol that is capable of awarding payouts and triggering the free spins at the same time. Either way, you don’t need the scattered Logos to appear on fixed lines, instead getting their prizes when there are enough of them present. 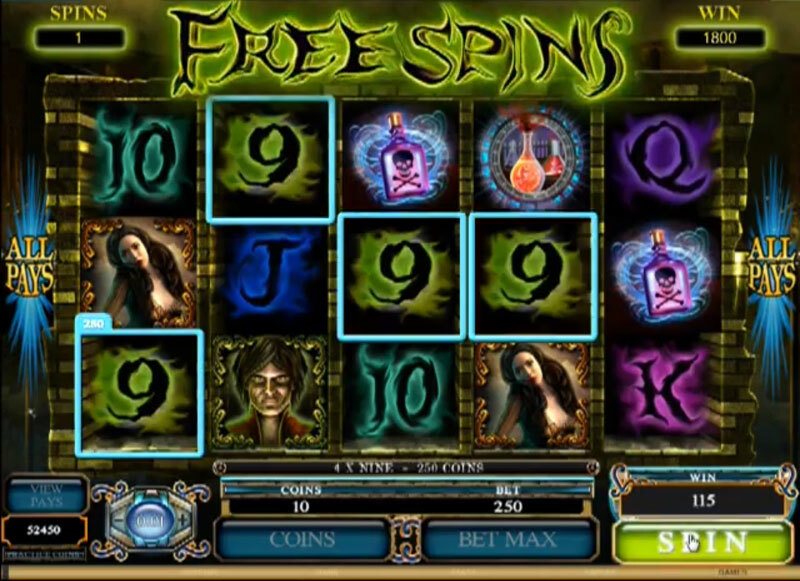 The free spins feature gets triggered by the scatter symbol, when at least three of them are placed on the reels, in the same round. 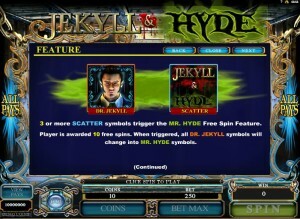 The result will be a round of 10 free spins, during which the Dr. Jekyll symbols are replaced with symbols of Mr. Hyde. 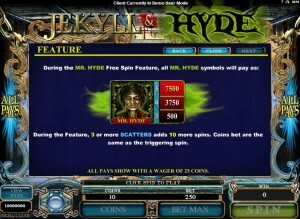 The advantage is that Mr. Hyde pays a lot better, offering up to 7,000x in prizes, while Dr. Jekyll only gives you up to 1,500x in the base game. 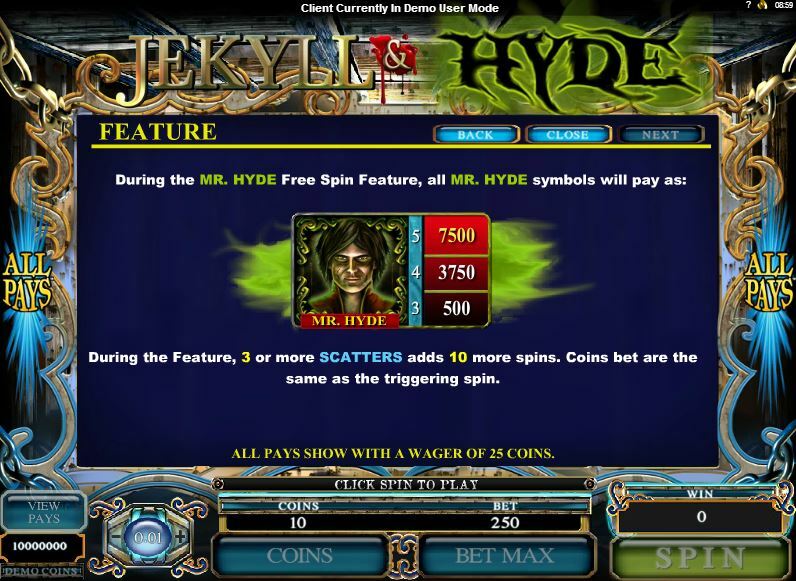 Getting 3+ scattered Game Logos again will trigger another 10 free spins, for more chances to get that top jackpot that only Mr. Hyde can award. You only need to bet on 25 lines in order to get all the ways to win active. Each of these lines has to be covered with at least one coin, though you can take it up to 10 coins per line. The coins have denominations between $0.01 and $0.10, so the line bet goes up to $1, while the maximum total bet is $25. The best payout you can hope for during the base game is 1,500x the line bet, or $1,500. The free spins do better though, and the top jackpot will be worth $7,000. The game doesn’t look that inviting, but that’s just because it manages to bring forward the atmosphere from the novel, so it looks a bit creepy, almost like you’re getting a glimpse into the psyche of the split personality that inspired it. There are spooky looking playing cards among the symbols, along with bottles of poison and the novel’s main characters. Symbols: Dr. Jekyll (1,500x), Game logo (scatter, 1,250x), Woman (1,000x), Deadly Poison (750x), Potions (500x), Ace (250x), King (150x), Queen (150x), Jack (150x), 10 (100x) and 9 (100x). 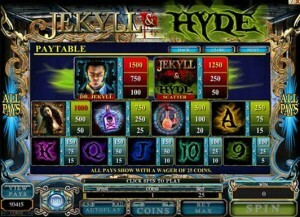 You will find it an interesting addition to the line-up of modern slots from Microgaming. It doesn’t have great graphics, but the free spins do get interesting whenever Mr. Hyde gets involved. If you enjoyed the story, the slot will be a nice way to go back to it. 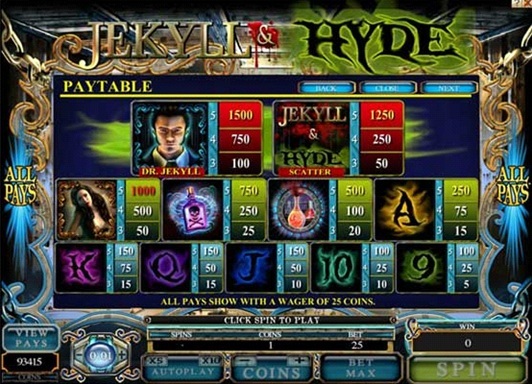 This Jekyll and Hyde slot is offered by all online casinos with Microgaming software, playable either in practice or in real money mode.